Since I see the first oranges in the orchard I run to the market to get some salted cod and spring onions to prepare this salad that you can find easily in every “bar de tapas“ in Malaga. It’s always been present in my mother’s kitchen and I could eat it every day when oranges are in season. In fact I almost do, I really love it for dinner in a more simple version, without potatos or egg. I like sharing this traditional recipe of Malaga in our cooking workshops, as using fresh oranges just picked from our trees gives this salad a new dimension. If salted cod is not available in your country, you can buy it in Amazon. It will last for months and once it’s been desalted for at least 24h. can be used as fresh cod, but with more flavor due to the salting process. Ingredients (for 4 p.): 3 oranges, two small spring onions, 150 grs. salted cod (I buy it in small fillets without bones), extra virgin olive oil, 2 medium size potatoes, 2 hard-boiled eggs and some fresh parsley. Put the salted cod in a wide bowl or jar, cover with water and keep it in the fridge for about 15 hours (we don’t want to remove the salad completely in this case) changing the water 2 or 3 times to remove the salt*. Blanch the unsalted cod by dipping it in boiling water until it gets white (about 1 min). When it’s cold enough to manipulate flake it and put in a jar or bowl soaked in olive oil. Set aside. Cut the spring onions in thin rings using only the white part and mix carefully with the cod. Peel and chop the potatoes in regular medium dices. Boil or steam them until tender. Set aside and allow them to cool down. Quarter or slice the hard-boiled eggs. Reserve. To peel the oranges (this is just a suggestion), cut the tops and the bottoms off, slice in facets down the orange to remove sides, make sure to remove the white pith. Halve the orange removing the central white nerve, cut in slices crosswise and reserve. Optional: emulsify 4tbsp virgin olive oil and 4tbsp fresh orange juice and pour this seasoning over the salad. 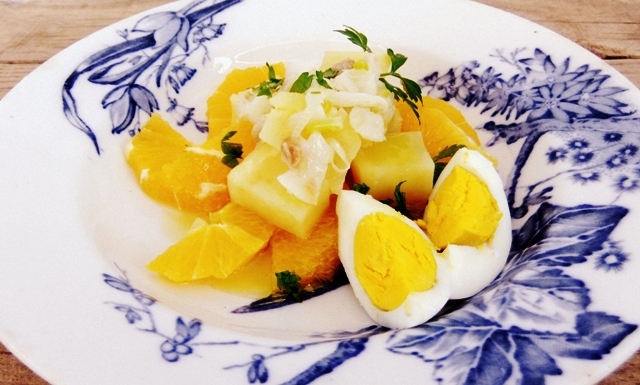 To plate up the salad: place some orange slices onto a plate, cover with a few potato dices and top with a spoonful of the cod, spring onion and olive oil mix, placing the eggs quarters on one side. Pour 2tbsp of seasoning and sprinkle some chopped fresh parsley on top of the salad. Have a good loaf of bread ready to dip in the sauce…it’s an experience. *The time you must keep the cod in water for this salad will vary depending on how thick and salted your piece is, but in general 15 hours is fine. Take a pinch and try, it shouln’t be too salty. A final tip: you can prepare the salted cod and keep it covered with olive oil in the fridge for several days, take it out of the fridge with time so the oil gets liquid again.